One Year Later, 'Inside Japan's Nuclear Meltdown' A small group of engineers, soldiers and firemen risked their own lives to help prevent a complete meltdown after the quake and tsunami hit. Investigative reporter Dan Edge chronicles the aftermath of the disaster in a new Frontline documentary. 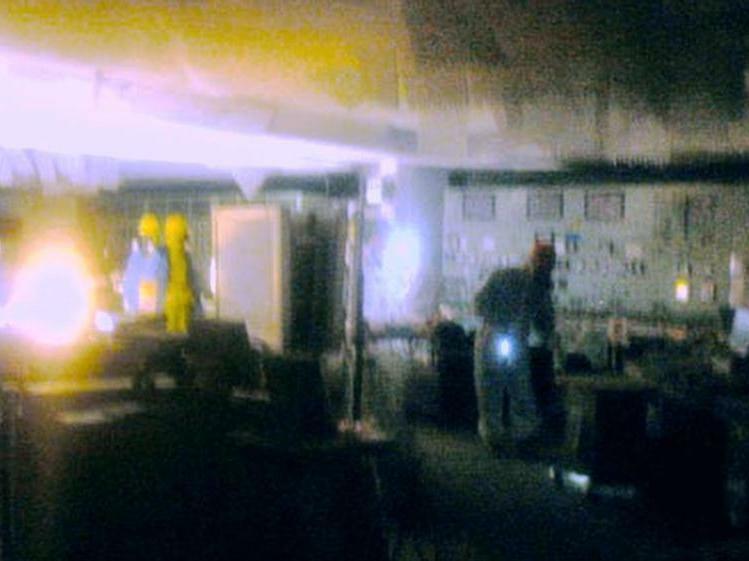 After the earthquake, workers were sent inside Reactor 1 at the Fukushima plant to release some of the pressure building up inside the reactors. In the days after a tsunami crippled Japan's Fukushima power plant almost one year ago, a small group of engineers, soldiers and firemen risked their own lives to prevent a complete nuclear meltdown. Investigative reporter Dan Edge wanted to find out what it was like for the workers who were inside the Fukushima Dai-ichi plant when the crisis began. His new Frontline documentary chronicles what happened to those plant engineers, as well as what happened to the small corps of workers who entered the power plant in the days after the disaster. Edge talked to reactor inspectors, Fukushima residents and nuclear scientists in the Japanese government to piece together Inside Japan's Nuclear Meltdown, which premieres at 10 p.m. EST Tuesday on PBS. He tells Fresh Air's Dave Davies that after the earthquake and tsunami hit, power went out in Fukushima Dai-ichi, leaving the remaining workers stranded in the dark. "It must have been horrific for them," says Edge. "Not only do they have no power for the cooling systems, they have no lights for the instrumentation. They do not know what is happening inside the nuclear reactor. They feared the worst." Improvising, the workers went out into the parking lots of the plant and ripped car batteries out of their cars in order to bring some of the instrumentation in the plant back to life. "They discovered that the pressure in the reactor is out of control," he says. "It's much, much, much too high. And this is a nightmare scenario for someone who works in nuclear power plants." The Future Of Nuclear Energy In The U.S. The workers feared that a hydrogen buildup within the plant plus building pressure would create a huge explosion. "They needed to vent the reactor and essentially pipe all of that gas into the atmosphere," says Edge. "This is a really big deal. Some of the workers we spoke to were just horrified when they realized what they were going to have to do. They were going to have to release radiation into the atmosphere. This is like the No. 1 rule of running a nuclear power plant: You don't do that. But the alternative was much, much worse: The alternative [was] a nuclear reactor potentially exploding, showering nuclear fuel over the area, which would be much, much worse." The workers at the plant opened their emergency manual and looked for instructions for how to manually vent the radiation into the atmosphere without using electricity. There were none. "What you have throughout that [first] night is the workers pulling out the blueprints of the plant, going back to square one and trying to work out, there and then, in the middle of a nuclear disaster, how to vent a nuclear reactor," he says. Meanwhile, officials at the utility company that owned the reactor and officials in the Japanese government were watching the disaster from Tokyo. Then-Prime Minister of Japan Naoto Kan had given the orders to vent the radiation and was waiting for news that the reactors had been vented. But at the plant, the venting wasn't happening because the workers were struggling to figure out how to do it, says Edge. The surrounding communities were also terrified. Edge describes one resident who lived 2 miles from the plant and didn't know whether to continue to search for members of his immediate family or escape to a safer place with his young daughter. "He made the decision to leave," says Edge. The prime minister, meanwhile, decided to go to Fukushima Dai-ichi and landed in a helicopter at the site. "He came under a lot of criticism. A lot of people said, 'What can you achieve by landing in the middle of a disaster?' " says Edge. "The prime minster says he did a crucial thing that morning. His argument is that he looked the plant manager in the eye, and he developed an understanding with him that was crucial to the functioning of the emergency response over the next few days. This debate continues to rage in Japan." The plant workers — all of whom volunteered — figured how to manually vent the radiation, at great personal risk to themselves, says Edge. They worked in relay shifts, going into a pitch-black, hot environment in full hazmat suits where the radiation equipment was not working. "What they are doing is walking into the unknown," he says. "So they don't know how badly the radiation levels will be in the reactor building. ... And they don't really know where they're going." In teams, the workers went into the plant and attempted to open the vent. Hours later, they were successful. Radiation levels around the plant began to rise and pressure levels began to drop. But the team, says Edge, still needed to cool the water around the reactor to stop a complete meltdown. "By 2 o'clock on the day after the tsunami, they had rigged up an improvised system that could get water into the reactors," he says. "... Things started to look like they might have a solution in place. And suddenly, [there's an] explosion. They feel a colossal rumbling. They can't see what's happening. There's a moment of confusion, and suddenly engine men start piling into the emergency control center. At that moment, the workers think the reactor itself has exploded." What that would mean, he says, is fatal levels of radiation throughout the plant that would have killed the workers. It wasn't until hours later, when the workers had left their bunkerlike control center, that they realized it was a hydrogen explosion — and not the nuclear fuel rods. For the next few days, workers left the plant until only a small team of volunteers remained. Soldiers were also brought in to help cool the plant. By the time Reactor 3 exploded three days after the tsunami, there were only 250 people remaining onsite. Had these workers not stayed, says Edge, it's hard to predict what would have happened. There was talk in Tokyo of evacuating everyone within 125 to 190 miles of the plant, which included the capital. That would have ground Japan to a halt, he says. And one worst-case scenario involved not only a meltdown of the reactors, but a melt-through, where the nuclear rods could have melted through their containment vessels and into the ground. "Essentially then, they are in the water table and the radioactive contamination is much worse than it turned out to be," says Edge. "It's called China syndrome, on the basis that if such a thing were to happen in the States, you could have nuclear fuel melting all the way through to China. That would never happen — but it's the worst nightmare of someone who works at a nuclear power plant." At this point, he says, Kan made a direct plea to the workers remaining in the plant to stay. "He asks everyone over 60 to stay and take the lead," he says. "He couches this in terms of a war, saying, 'This is a fight,' and he orders them to remain." The Fukushima 50, as they became known, stayed behind in the plant, where radiation levels were extremely high. At the same time, officials outside the plant realized that the spent fuel pools at the plant were becoming extremely hot and were in danger of exploding and creating a plume of radiation. They brought in local firefighters and started flooding the plant with water. In the end, the uncontrolled complete meltdown was averted. Today, Fukushima is a ghost town. The reactors are buried under tons of rubble and have reached a state of cold shutdown — the temperature where the reactor is cool. It will likely take 20 to 30 years to clean up, says Edge. And a 12-mile exclusion zone around the plant has forced more than 100,000 people from their homes. "There are areas you really don't want to hang about in," says Edge. "And there are areas where levels are comparatively safe. So the challenge that faces the Japanese government, if possible, is to bring people back to their homes if it's safe, or develop a decontamination strategy to try and make areas safe that aren't now. But these are all things for the future, and the government is feeling its way toward this at the moment."